A team of scientists from the University of York, the Helmholtz-Zentrum Berlin (HZB) Germany, and Radboud University Nijmegen, the Netherlands, have developed a new class of magnetic material which flips magnetic state when zapped by an ultra fast laser pulse. This should pave the way to mass storage devices with improved performance and power efficiency compared to current day technology. The new material demonstrates the use of a synthetic ferrimagnet comprising a sandwich of two ferromagnetic materials and a non-magnetic spacer layer. The spacer layer engineers the coupling between the two ferromagnets so that they align opposite one another. When subjected to an ultrafast laser pulse, this structure spontaneously switches its magnetic state representing writing a single bit of data. Dr. Richard Evans, the corresponding author from York's Department of Physics, explained: "Energy efficiency is one of the most important goals for technological devices due to their expanding use with an increasing world population and resultant demand for energy. 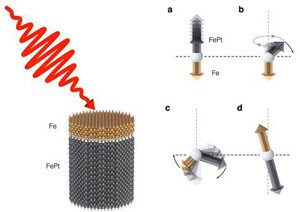 The synthetic ferrimagnet structure overcomes the intrinsic problems of rare-earth-transition-metal alloys and paves the way for a new class of magnetic materials and devices with improved performance and power efficiency. The results are a significant step towards realising a device based on thermally induced switching as it shows that structures on the nanometer length scale can be used." The research received financial support from the EU Seventh Framework Programme, as well as the Netherlands Organization for Scientific Research (NWO) and the Foundation for Fundamental Research on Matter (FOM).